You’re about to write a resume for one of the most competitive jobs in the world. It will end up in a heap of 250K other investment banking resumes. All of them from equally determined and qualified candidates. Can you feel the pressure already? If you really want to land the job, your investment banking resume must look like a million dollars. And this is exactly what yours will look like in 15 minutes. An investment banking resume better than 9 out of 10 other resumes. How to write an investment banking resume that will land you more interviews. Tips and examples of how to put skills and achievements on an investment banking resume. How to prepare an investment banking job description section on a resume to get any job you want. 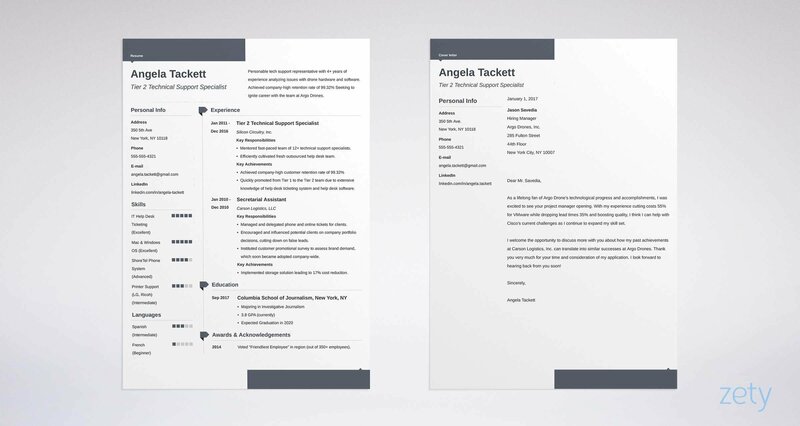 Here’s a sample investment banking resume made with our online resume builder. Sample Investment Banking Resume - See more templates and create your resume here. What’s the Best Investment Banking Resume Template? About three percent of applicants are offered positions with the most prestigious investment banks, such as Goldman Sachs or JP Morgan. And this doesn’t mean the recruiters will be looking at 10 investment banking resumes to pick 3 best candidates. They’ll be sifting through a humongous heap of about 250,000 investment resumes. In this context, it’s a bit of an understatement to say that your investment banking resume must stand out. It has to be at least as impressive as the Vodafone-Mannesmann deal. 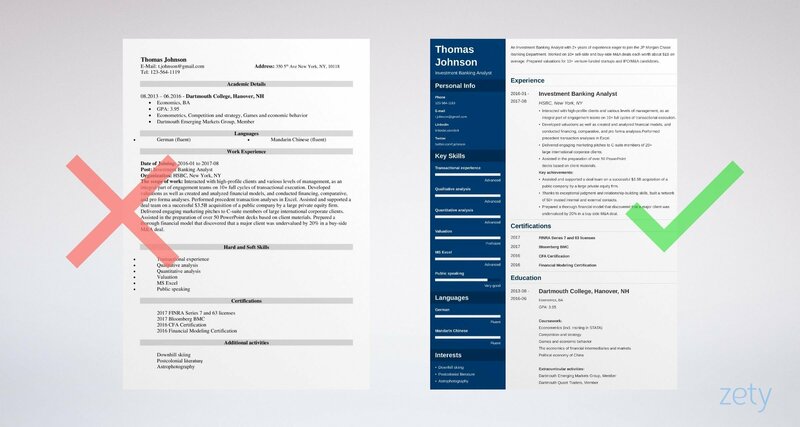 Make sure your investment banking resume sticks to the reverse-chronological resume format. For one thing, the reverse-chronological format is the best as it’s easily scannable. It lays out all the details in a way recruiters understand. Plus, it’s the go-to format if you want to make sure your experience and achievements get the right attention. Make good use of white space. Export your investment banking resume to a PDF file. The PDF format is like investing in CDs. Very safe. Now, let’s move on to the next step. Still not sure about the best format for your investment banking resume? Here’s a quick read:Best Resume Format: Which to Choose? Investment Banking Resume Summary or Resume Objective? Before you start earning that six-figure salary, you must earn six seconds of the recruiter’s attention. That’s right. An average recruiter will spend 6 seconds scanning your resume. And they’ll glance straight at your investment banking resume objective or summary first. So make sure yours delivers like Jimmy Lee. Investment banking resume objective: two or three sentences explaining to the recruiter why you’re a great fit. It’s best suited for freshers or those whose experience in the field is limited. Investment banking resume summary: summarizes your experience that matches the position you’re after. Works best for those with previous experience in the field. A motivated and skilled graduate holding a BA in Economics from Dartmouth College (GPA 3.9.) Worked as a summer analyst at BNP Paribas as part of M&A team on a $100M deal. Also interned as an M&A generalist with a boutique bank Allen & Company. Speaks fluent Russian and Mandarin Chinese. Looks for a position of an investment banker. Holds a BA in Economics. Great communication skills. The candidate from the wrong example? Fine, communication skills matter, but they don’t get jobs. Everyone’s a self-proclaimed great communicator on their resume. The first candidate doesn’t even have to mention communication skills by name because they show through. Instead, they add knowledge of foreign languages, which is a very desirable skill in the world of investment banking. An Investment Banking Associate with 10+ years of experience. Worked on and closed 20+ sell- and buy-side M&A deals each worth about $1B on average. Collaborated with CEOs and CFOs at 10+ venture-funded startups and IPO/M&A candidates. Served as a recruiter, and mentored over 10 new Analysts and Associates. Experienced Investment Banker who has worked on a number of M&A deals. Collaborated with C-Suite members. Coaching experience. It’s not really much of a surprise that a resume summary statement presenting the candidate’s track record, achievements, and quantifying whatever’s possible leaves the other example far behind. Any deal can turn into an ordeal unless you close it. And where do you close the deal with the hiring manager on your resume? In the job description section. You need to craft it with the attention worthy of constructing a synthetic CDO. Go through investment banker jobs online to find a position that matches your experience level and qualifications. Participate in the "full cycle" of transactional execution including preparing marketing pitches, reviewing and formulating financial analysis, preparing and presenting internal committee memoranda and client presentations. Have a working knowledge of the relevant industry sectors and the Firm's product and service offerings. This person will be expected to develop expertise in the quantitative and analytical practices used to develop strategic, capital structure and valuation recommendations to clients and will work alongside senior bankers in providing relationship support and executing transactions. The sections in yellow show you exactly what skills the recruiter is looking for. Treat the job ad as a guide that shows you how to cook up your own investment banking job description. Plus, it has all the keywords recruiters look for on an investment banking analyst resume. Interacted with high-profile clients and various levels of management, as an integral part of engagement teams on 10+ full cycles of transactional execution. Assisted in the preparation of over 50 PowerPoint decks based on client materials. Delivered marketing pitches to C-suite members of 20+ very large corporate clients. Developed valuations as well as created and analyzed financial models, and conducted financing, comparative, and pro forma analyses. Performed precedent transaction analyses in Excel. Assisted and supported a deal team on a successful $3.5B acquisition of a public company by a large private equity firm. Take a good look at the original job posting, and compare it with the personal banking resume job description section above. You’ve just prepared the best investment banking analyst resume for the job on offer. By crafting your resume on the basis of the offer itself. Do you remember how many resumes a bulge bracket investment bank such as Morgan Stanley can get? Close to a quarter of a million. Do you really think the hiring managers have nothing better to do but read 250K documents to manually select top 3 percent? ATSs, or Applicant Tracking Systems, sift through the deluge of resumes to pick the ones with the resume keywords for investment banking. The ones used on the original job posting. And this is exactly why you absolutely need to reply to a specific job offer. If you want to go past the initial ATS screening, your resume must contain the keywords recruiters look for on an investment banking analyst resume. As easy as first grade algebra. You may have noticed the key achievements subsection right under the job description. Use this section to give more prominence to the things you’re particularly proud of, especially if they’re quantifiable. To craft the winning investment banking resume job description follow these simple rules. Always reply to a specific job ad. Use the keywords from the job posting when describing your experience to go past the initial ATS screening. Go for resume action words to describe your investment banking skills. Highlight your achievements, not duties. In other words, show how well you can carry out investment banker responsibilities. You can do it by by putting numbers wherever you can, or adding a separate key achievements section. Honesty and strong work ethics are the qualities which will get you far as an investment banker. Don’t be tempted to simply copy-paste the job description from the job posting into your resume. This will get you past the initial screening stage, but you will get exposed later on. Use the job description to your advantage, but do it wisely. The first step is to identify the opening that matches your investment banking experience. You have all it takes to take Wall Street by storm. Sorry to disappoint you... but so do the other 249,999 candidates. And no one will cut you any slack. You’re about to learn the most crucial skill of them all. You’re writing your investment banking resume. It’s expected of you to have the necessary set of skills. If you didn’t, you wouldn’t have applied in the first place. At this point, it’s all about how you communicate those skills. Your investment banking experience section has already shown quite a lot about what you’re capable of. Just look at your investment banking job description again. Go through your investment banking analyst resume bullets one by one. Take away all the extra information, leave the essence. It’s entirely based off of your own job description! What you can do now is put those skills in a separate key skills section on your “Wall Street” resume. First, your key investment banking skills section is not taken out of thin air. Second, it lists only the skills relevant to the position you’re applying for. Third, you can easily prove each skill by referring it straight to your investment banking experience bullets. All this will come in handy in an interview when you’re expected to back everything you put on your resume up. In the world of investment banking, irrelevance is not just unwelcome. It’s penalized. Sprinkle the relevant skills throughout your banking resume. The experience section is the best place to start off with. Draw more attention to your investment banking skills by putting them in a separate key skills section. The investment banking resume sample at the top of the page may serve you as a guide. If you’re having second thoughts about your educational background, you probably don’t know much about investment banking at all. If you’re fresh out of college, just know that serious investment banking is a straight A students’ game. And you’re not supposed to have graduated from just any college. Your GPA is of paramount importance. And so are the courses you took. Obviously, as you move up the career ladder, the weight of your GPA and courses gives way to your real life experience. An experienced investment banking resume education section would be limited to the names of schools you graduated from. If you hold relevant finance certifications, such as FINRA licenses (Series 7, etc. ), Bloomberg certification, etc., make sure you list them in a separate section of your investment banking resume. Talking about hobbies on a resume can be hit-or-miss. We’ll show you how to hit it out of the ballpark. Your hobbies and interests do matter, especially when you’re a fresher. Yes, you should have a keen interest in finance. But don’t put that in the hobbies section. Use the hobbies section to talk about things that would show you’re a cultural fit. Look up the company you’re applying to and find out what they enjoy doing. But don’t try to blend in at all cost. Pick things you’re passionate about that could also become a conversation starter for the interview. You’ll be spending 90+ hours a week at work. If you’re a bore, no one will want to work with you. How About an Investment Banking Cover Letter? In the language of money, numbers speak louder than words. And as an investment banker, you know the power of doubling. Just as doubling a penny a day for 30 days will turn you into a millionaire, writing an investment banking cover letter will double your chances of landing an interview. For one thing, cover letters still matter. For another, an investment banking cover letter is hard evidence of your communication skills. Your successful papers and speeches. Your work with clients to deepen the understanding of their needs. Difficult problems with a client, or deal you resolved thanks to your communication skills. So don’t take your cover letter as read, and craft it meticulously. If you’re not really sure how or what to write, make a beeline for our guide on how to write a perfect cover letter in 8 simple steps. You can write your cover letter in our resume builder. Investment banking is a highly competitive field. Even though there are a plethora of qualified candidates, only a select few will ever make it. That’s why it’s so important to craft your investment banking resume down to the last detail. Have an easily scannable layout. Begin with a strong objective or summary. Offer a powerful job description section. Show off your skills required for the position. Be accompanied by a winning cover letter. Have you been writing an investment banking resume for the first time? Or maybe you’re an investment banking pro eager to help the young guns out? We’d love to hear from you. Give us a shout out in the comments below!